The Dublin Whiskey Distillery Co. (D.W.D.​) is the last of the ​i​conic Irish ​whiskey ​brands still in independent ownership. Based in Dublin, Ireland, D.W.D. specialises in the procurement, design and brand management of our proprietary whiskey expressions to meet the growing global demand for Irish whiskey. 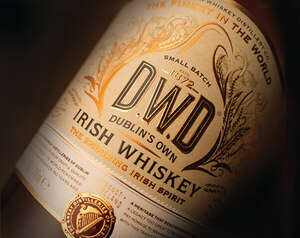 In the annals of Irish distilling, the name and reputation of D.W.D. is one of the most illustrious. We have embraced the opportunity to return this icon of Irish whiskey to the market along with the ambition that the D.W.D. mark will once again set a standard of quality and excellence through our brands and our whiskey. The revival of the D.W.D. brand has begun with the creation of a new independent Irish whiskey blender and bottler with long-term strategic access to the very best aged whiskey stocks which are selected and managed by a panel of exceptional distilling and blending expertise. The launch of the D.W.D. Heritage edition, exactly 71 years to the day after the original D.W.D. distillery was sold at auction, marked the start of a journey that will, we believe, restore the reputation of what was once one of the world’s most sought-after whiskeys.